This place is not just unlikely: for most of the time it doesn’t even exist. The Beacon is a community-focussed business centre, sitting where Westgate Road meets Wingrove. 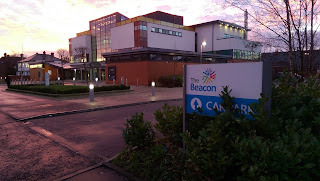 Opened in 2012 on the site of what used to be a fire station, I have actually been here for the odd meeting. To the right of the main entrance is a café, where I might once have had a coffee. They have sandwiches, probably, and baked potatoes, maybe, but it’s not the sort of place that would demand a review on this page. Or so I thought, until I heard whispers from an Indian friend that something very interesting happens there after office hours. 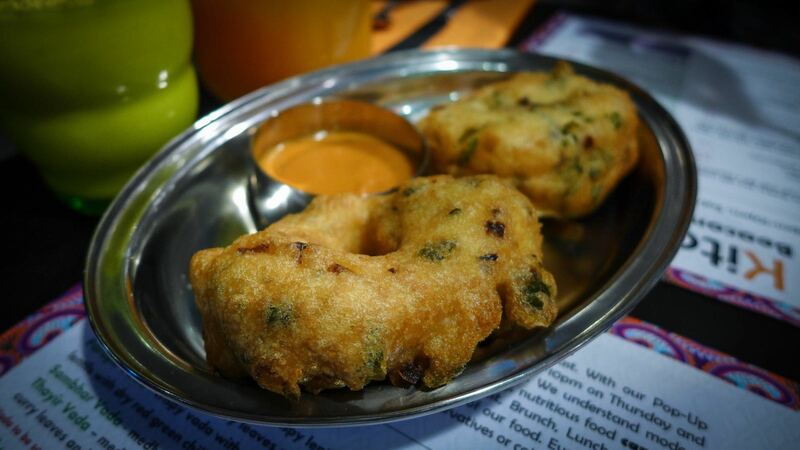 Once the office workers have left and darkness falls, a separate army moves in and transforms the place into one of the most exciting new eateries in the City, a Southern Indian as authentic as any you could wish for. 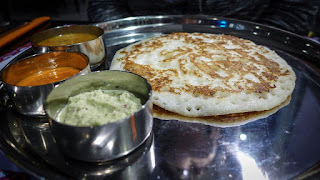 That was the rumour: Mrs Diner and I set off one blustery evening, intrigued to find out if we could really find the flavours of Tamil Nadu and Karnataka in a humble café on the West Road. Our drinks gave the first hint. My mango lassi was pukka, sweet fruit in proper balance with the lactic tang of yoghurt and, perhaps, just a touch of salt. 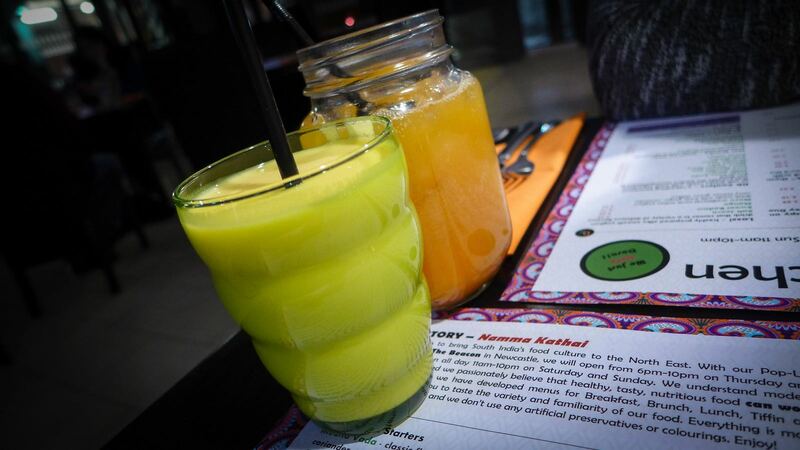 Mrs Diner’s mango fizz was similarly refreshing. Then the food arrived, and with it came the superlatives. “Flipping amazing,” I muttered in the direction of a portion of chilli paneer in which batons of the cheese had been fried with onions and peppers before being coated in a rich, addictive chilli sauce. Actually, the word I used might not have been “flipping”. “Fabulous — try this,” came Mrs Diner’s response, as she impaled a perfectly crisp medhu vada - a southern indian doughnut made using skinned black lentil batter - and dunked it in a judiciously spiced tomato chutney. Gobi 65 was a triumph. 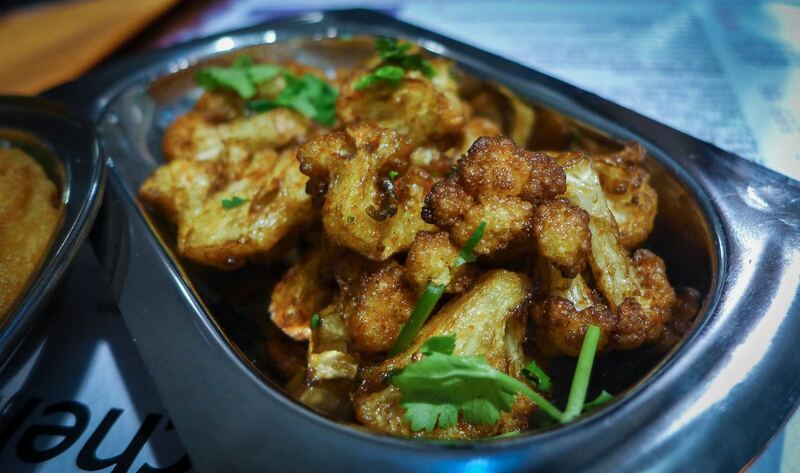 I’ve had Chicken 65 before (there’s no consensus on where the “65” comes from, although some say it was invented in a Madras hotel in 1965, others that it has 65 spices, which it doesn’t) but this rendition turned the humble cauliflower into a delight of garlic, ginger and chilli. Our final starter, all served in dinky silver tiffin plates, was a knock-out lamb chukka, a dry-cooked dish in which the meat had made friends some with properly softened onions and a beguiling fennely spice mix. For me the test of any good South Indian restaurant has to be the dosa. Down on Newcastle’s Quayside, the Keralan restaurant Rasa (now mysteriously renamed Ury) had always satisfied my cravings for this wafer-thin fermented vegetable pancake. 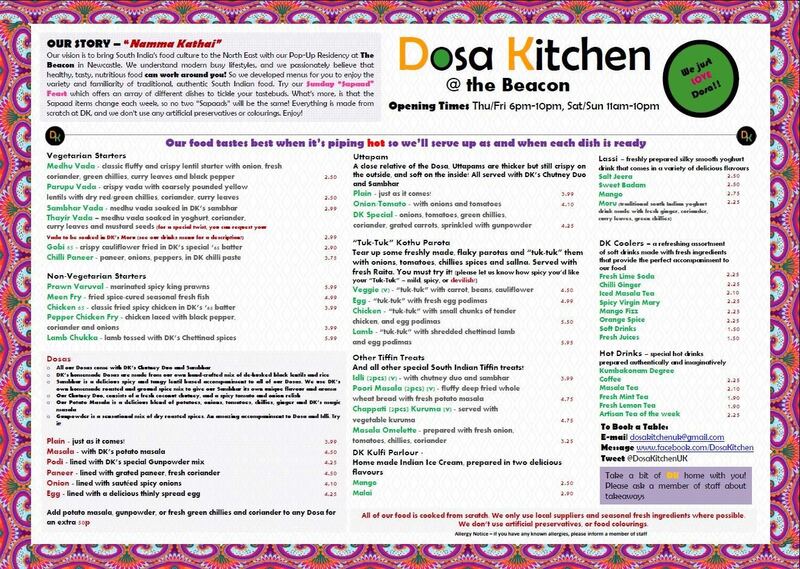 But Dosa Kitchen is true to its name. 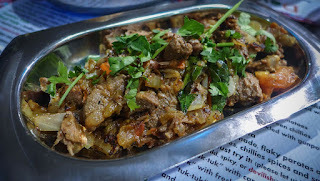 Ours had a wonderful depth of flavour (a tribute to long fermentation) and was served with a tangy sambar and some lively coconut and spiced tomato chutneys. I don’t recall having had more enjoyment from £4.10 in a very long time. Mrs Diner’s Uttapam (don’t you just love these names?) was a slightly thicker version of the same batter, like a flattened crumpet, and equally good. 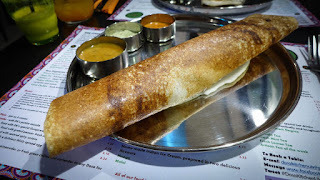 We had struggled to decide what to order - honestly, I could happily have stayed all night and tried the lot (they do a feast on Sundays, which is the proper way to try South Indian food) - but the owner went out of his way to talk us through the dishes and make recommendations. You won’t find any chicken tikka masala on this menu, thankfully, but if you’re concerned about not knowing what you’re ordering, then don’t be: the staff we spoke to were all supremely friendly and very much knew what they were about. 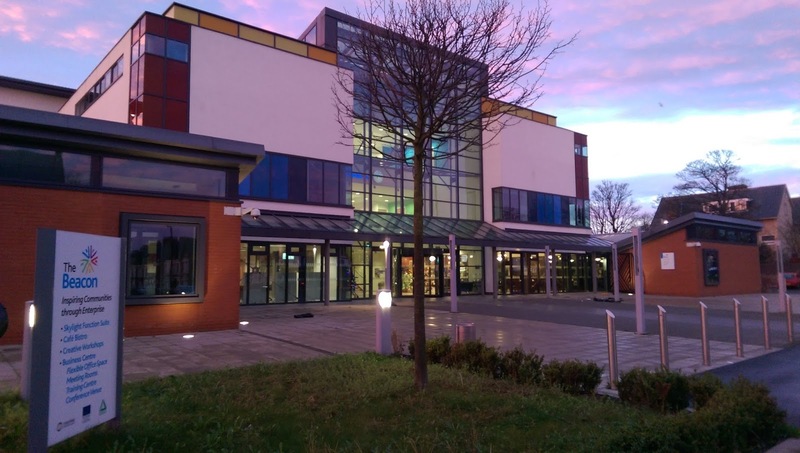 It’s a place brimming with genuine warmth and dollops of enthusiasm. I had been really looking forward to trying their homemade kulfi, a subcontinental ice-cream treat of sheer decadence when done right, but they had run out, so we finished with coffee made from a mix sent over from the old country that included ground roasted chicory. The kulfi will have to wait until next time. And there will be many next times. At the moment they don’t even have a telephone: to make a reservation you need to go on their Facebook page (linked from the website) and send them a message. You’ll get a cheery reply and a secret mobile number to call. Towards the end of our meal, the chef, Sudharsan Prabu, came out to check what we’d thought of his cooking. I tried to avoid going into full-on sycophantic mode. 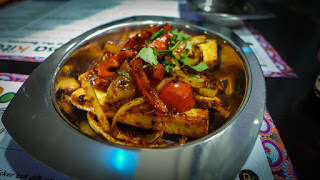 A little online research reveals that Sudharsan used to work at the Dakshin in the Park Sheraton in Chennai — it is famous for its South Indian dishes. That he should now pop up (literally) in this unlikely spot on the West Road is a treat that needs to be exploited by anyone who claims to like Indian food in our region. 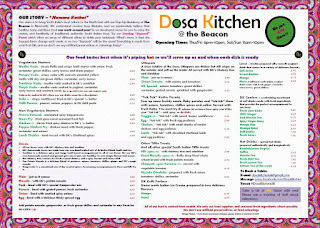 Dosa Kitchen does describe itself as a “pop-up” restaurant, which refers to their opening hours and strange location. Let’s make sure they don’t feel the need to pop down again anytime soon: just go.